The National Audit Office has warned that despite £382m spent every year on monitoring schools and interventions, there are weaknesses in government efforts to raise school standards. The NAO questions how much the Department for Education knows about problems at school level, in a system with increasing autonomy for individual schools and academy chains. However when democratically accountable local authorities use their powers to intervene there’s an immediate improvement at the next Ofsted inspection in two thirds of cases – far more successful than the DfE’s ideologically-motivated strategy: insisting on sponsored academy status. 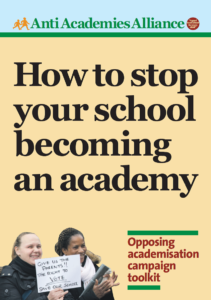 Anti Academies Alliance research showing the declining popularity of academy conversions was picked up by Warwick Mansell writing in the Guardian this week. 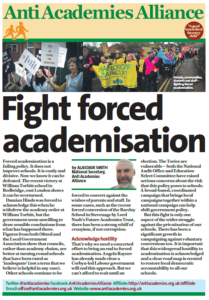 There’s no doubt we’ve passed ‘peak academisation’ for secondary schools and the vast majority of primary schools have chosen to remain with their local authorities. The research shows that the peak of secondary conversions occurred in 2010-11 and for primaries in 2013. Now more than ten years after the very first academy opened the academies programme has failed to convince the majority of schools. 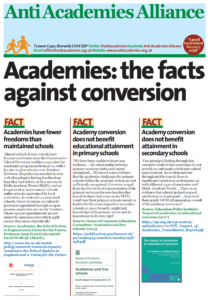 Whilst initially schools were bribed to convert, with extra funding of hundreds of thousands, now that the money has dried up, conversion rates have stalled. Exclusive analysis in the Independent revealed what we’ve known all along about the free school programme – that it’s wasteful, risky and badly planned. Over £1m was spent on schools that never even opened while ‘inadequate’ schools have cost over £50m. The figures show that a third of the 79 first and second wave free schools were judged as inadequate or requiring improvement by Ofsted. This compares with one in five of schools overall. Figures show that 79 per cent of pupils in local authority-run schools reach the required standard in reading, writing and maths tests for 11-year-olds – compared with 70 per cent in free schools. The failing free schools have now been handed to new sponsors; with one exception: IES Breckland – the country’s only for-profit state school. Although Ofsted described governance as inadequate and said it failed to ensure that the school met safeguarding requirements, the same Trust continues to run the school. The question whether Norfolk’s Inspiration Trust received notice of its Ofsted inspections refuses to go away. Ofsted Director Sir Robin Bosher’s investigation conceded that the Trust’s Chief Executive, Dame Rachel de Souza, was ‘mistakenly given sight of a schedule’ that included the planned inspection date for Great Yarmouth Primary Academy during her training to become an Ofsted inspector. But Sir Robin concluded there was no evidence that Dame Rachel had passed on the information. Ofsted changed the date she had seen from 7-8 May to 13-14 May. Now emails, uncovered by the Guardian, show that three weeks before those inspections Dame Rachel informed her secretary: “14 and 15th May – please do not add any further appointments – I am expecting a late notice very important event on or around those days.” The school’s principal, Bill Holledge also turned down an offer to attend an important event on 12 May – an invitation from David Cameron to visit Downing Street. Meanwhile answering the query over lavish spending on a £420 Vera Wang tea set, the Inspiration Trust defended itself claiming it “has furnished many of its offices with furniture that is either second hand or received as a gift”. Surely taxpayers don’t expect schools to be furnished with second hand or donated furniture but we do want a system with proper checks and balances. In the same week we learned that Dame Rachel de Souza has been appointed – yes ‘appointed’ not elected – to the Headteacher Board which will advise the Regional School Commissioner in the East of England – a region covering thousands of square miles from Hackney to Peterborough. The Tories have announced that should they win in 2015, RSCs will be given additional powers to ‘intervene’ in ‘failing council-run’ schools as well as academies and free schools. NASUWT members at two academies are now saying enough is enough to changed working practices. Escalating strike action is underway in Lincolnshire and in Salford. In a parliamentary exchange with Caroline Lucas MP, the Schools Minister Nick Gibb equated improved GCSE and SATs results in Brighton and Hove with coalition education policies. Not only were the five schools he named and praised all local authority schools, he didn’t even mention the academies in the city. In fact the city has nine state secondaries of which only two are sponsored academies and there are no converters thanks to the successful campaigns at Hove Park and Varndean. The Local Schools Network probed how far the two sponsored academies contributed to Brighton and Hove’s success. Both academies require improvement according to Ofsted. Results at Portslade Aldridge Community Academy rose from 38% A*-C GCSEs (or equivalent) including Maths and English in 2012 to 60% in 2013. Results at Brighton Aldridge Community Academy rose from 40% to 46% in the same period. However when equivalents are removed, the academies’ results drop to 50% and 12% respectively. The Headteacher is currently absent from the Portslade Aldridge Academy while investigations are underway into “the registration status of a small number of students”. Portslade hit the headlines back in 2013 when 40% of its teachers left at the end of the summer term. Both academies are sponsored by Rod Aldridge, founder and previously CEO of the Capita outsourcing company. Aldridge resigned as Capita’s CEO in 2006 over a £1m loan to the Labour Party. Private Eye magazine has revealed that Labour’s shadow education secretary Tristram Hunt accepts a £74k researcher from Price Waterhouse Cooper. This is the accountancy and consultancy operation that’s handling the multi million pound outsourcing of academy chain AET’s support services. No doubt edubusinesses are doing all they can to safeguard their own future whatever happens in May 2015. Sheila Doré of the SEA (Socialist Education Association) writing in Left Futures questions further who has the ear of Tristram Hunt. Hunt, she said, appeared most at home at the Labour conference when sharing a platform with Jonathan Simons. He’s head of education at the right-wing think tank Policy Exchange and chair of governors at Greenwich Free School (Ofsted grade: requires improvement). Meanwhile the AAA met on 11 October to discuss Education and the General Election. We were joined by Emine Ibrahim, Labour Councillor (Haringey), Peter Downes, Lib Dem Councillor on Cambridgeshire County Council and Natalie Bennett, Leader of the Green Party. Natasha Steel, a parent at Hove Park School in Brighton told us about their fantastic campaign which stopped the conversion of their popular comprehensive in its tracks. Alasdair Smith, National Secretary, argued that Gove’s July 2014 demotion marked the high tide of the academies programme – we’ve moved from a high point of conversions in 2011 to Autumn 2014 when parent power forced a spectacular U-turn at Hove Park. Alasdair Smith suggested it was now time for the AAA to consider a new statement of intent and we’d really welcome your views. Here at AAA HQ we had to sit down with a strong cup of tea when we found ourselves agreeing with Dominic Cummings ex-Gove adviser and now free school proposer. He tweeted: “1/ Re Acads/Ofsted etc. a) Legal situation is a mess. b) Ofsted is a mess partic viz governance. c) EFA a mess. d) The messes overlap”.